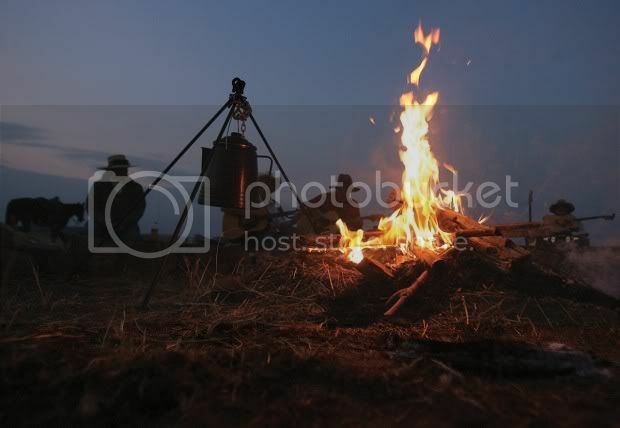 Well, it’s been a spell since I added a new western short story or even a recipe to my blog. I’ve watched the hits dwindle to a trickle. That’s fine, I never wrote anything to bump up my numbers. I know that’s how it’s done ’cause the blog folks all tell me I gotta post often or I’l be left behind. I never did get an answer as to exactly what would happen if my numbers slipped really bad. Maybe they’d kick me off for usin’ up precious ether world internet space, I don’t rightly know. Anyway, I was pondering on all this when an idea floated across my brain an’ got stuck somewhere’s between my frontal lobe an’ my modulla obligotta (or some other noteworthy misspelled section of my brain). I conked myself upside the head an’ the idea fell from my brain onto my tongue and I said to myself outloud, “Huh! Looks like a lot of folks like puttin’ they’s animals on their post.” Then I thought of my own wild beast. Now I ain’t no girly man. No offense intended to no one. I’ve come to figure a lot of writers is politically correct to a fault but I wasn’t brought up that way, so go ahead an’ take offense but I didn’t mean nothin’ more than I’m a big guy. Certain things is expected of folks my size. Like, if me an’ my friends was attacked by a Grizzly bear, it’d be up to me to turn him into that nights meal… bare handed while tending to things in the outhouse at the same time. You get the idea. No need to go any further. So what kind of wild beast roam around in my home? Snarling Pit Bulls? Wild Razorback Boars? No Sir! Them critters ain’t nothin compared to the ornery wild eyed beast I have pacing back an’ forth lookin’ for a constant meal. I’m talkin’ things that go thump in the night here! Beast that chew up things most other animals just stare at. 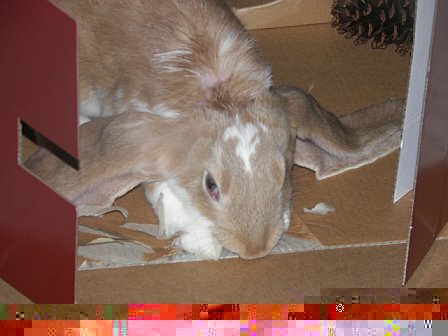 I’m talkin’ about the dreaded lagomorph… You got it…Bunny Rabbits! 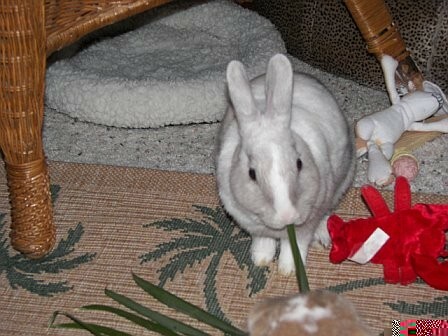 Now here’s a photo of Sir Benjamin (Ben Ben for short) I adopted him when I was a volunteer at the Humane Society here. 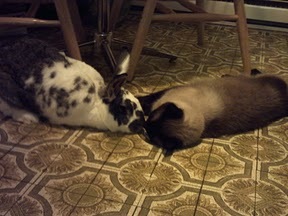 Like all my Bunnies, they are all spayed or neutered. They also are what are called ‘house rabbits’ as they have complete freedom to roam wherever they want in the house 24/7. They also are litter box trained. Actually, that’s a misnomer since they don’t need any training at all. Just put a plastic bin filled partway with bunny litter (I use Yesterdays News pellets or pine, never cedar chips as that can kill them) and they take to it right off. 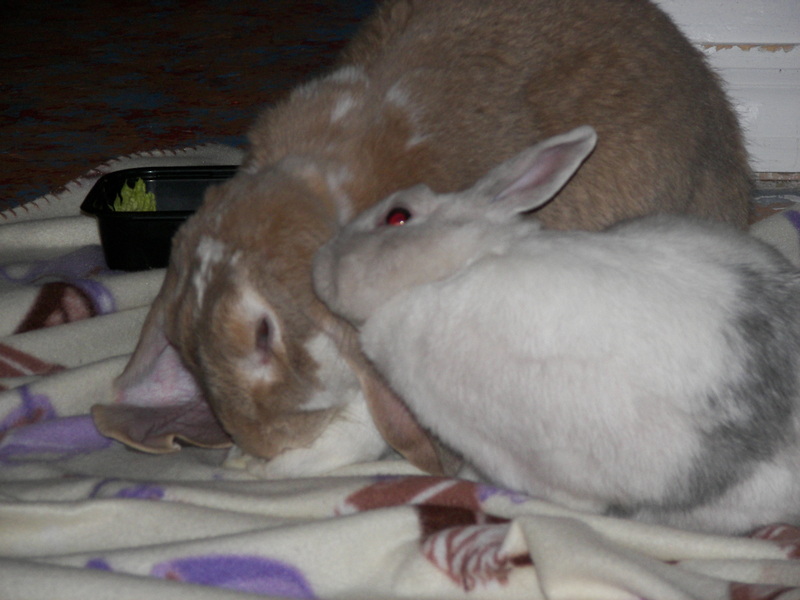 If you have more than one in the house you’ll find that the matriarch bunny will scold the others until they too know what a litter box is for. Ben gets along well with critters of any sort, no matter how much they swipe at him every time he passes. Then there’s Queen Elizabeth. She rules the household! 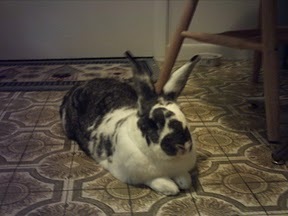 No bun gets out of line without her scolding at them. 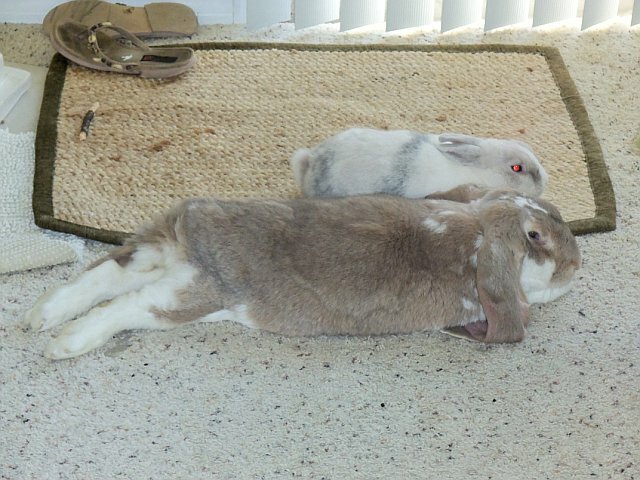 She’s an English Lop who’s papers actually do go back to the Royal Family over there in Merry Old England. She loves boxes and chewing on pine cones. Little guy (Scooter for short) is Lizzy’s soul mate. 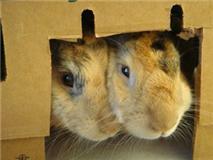 They are a bonded pair. Lizzy doesn’t mind that her man is 1/4 th the size of her since she rules over him anyway. He groomes her and makes sure her royal coat is free of snarls. This is Scooty’s favorite place to nap…under Lizzy’s ear. He’ll crawl up to her and tug at her ear until it covers him like a blanket. Then there are the Girls Daisy and Buttercup. 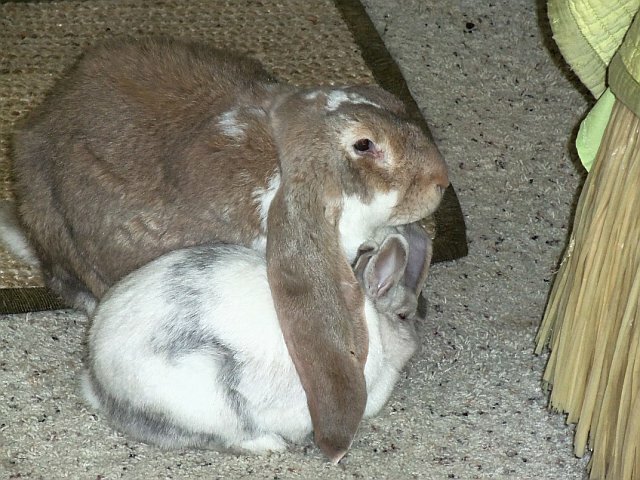 They now have a brand new home in West Virginia at a friends Bunny Sanctuary. They were to be euthanized but I rescued them and my friend took them in. They love their box. Being caught in the wild, they are a bit more skittish but a few dried cherries bring them out to play…and eat! Here’s a couple pics of Lizzy and Scooter doing what they do best. So there! These are the wild animals I have to deal with back at my spread! I am going to add one more picture here. I know some are squeamish but I got to show you just how viscous these beast can be…A vivid reminder never, ever take a nap with your shoes off or you’ll pay a horrible price. Ya got to remember these are wild beast an’ need to be treated like they is! I was warned, I just didn’t listen!